The holidays are such a perfect opportunity to be merry, celebrate and get together with friends and family. A lot of us might have been busy engaging in acts of kindness, exchanging gifts and of course getting the house all clean and spruced up for the festivities. As 2018 draws to a close, it is also a good time to allow the mind to pause, renew & reset itself with new energy to welcome 2019. In this reflective post, I’ve attempted to share some of my learnings and practices that help to ‘deep cleanse’ the mind of the emotional clutter, bringing in a sense of calm, well-being & lightness- almost like being on a diet from negative thoughts! As I sat down in my aisle seat of my Mexico bound flight I couldn’t help but notice a young child around 3 years old a few seats ahead of me. He was smiling and jumping in his seat often waddling up and down the aisle and waving to everyone he saw. It brought a smile to every single passengers face. And of course it would ! Children are an expression of sheer joy and enthusiasm. They exude presence. Isn’t that why we are so drawn to children? No matter how stressed we are, or how terrible the day has been, a simple glance from a child can melt away all that stress. Of course some mothers might argue about how frustrated they get when that innocent smiling child is suddenly irritable or cranky and drives them up the wall! We’re not focusing on the negatives today, but even in this situation, we can learn from children in how quickly they can snap out of negativity or a cranky mood and begin smiling or laughing. Before I got caught up in observing this little bundle of joy, my mind was reeling about an event dating back a few months. I was still upset that things hadn’t panned out the way I had desired and I felt let down by the concerned individuals. I had a sudden realization and in that instant I told myself to snap out of it. Would this matter five years from now ? Absolutely not! So it’s probably not worth brooding over a situation that was over. I was living in the past! The image of the child bubbling with enthusiasm in the present was a stark reminder for me to let go! Sheryl Sandberg, COO Facebook and one of my idols, cities advice from another amazing woman leader, Ariana Huffington in her famous book ‘Lean in’. Ariana speaks about how children can be our role models especially when it comes to bouncing back from negative emotions related to past situations and events . A child can cry one moment and run off to play the next. We wish as adults we could be strong enough to ignore what others say, and be totally unaffected by it. However experience and research tells us that this is often difficult to do. What we generally do is replay events from the past in our minds & hold on to the related emotions for months or sometimes years. These emotions ( anger, sorrow, regret, guilt etc) foster negativity in us taking the mind away from being in the present. Is this practice productive ? Absolutely not ! Does it help us to solve the problem? Perhaps not. Research says stress from negative thinking creates changes in the brain that may affect the likelihood of mental disorders such as anxiety,depression, ADHD, schizophrenia and mood disorders. Sheryl finds what works for her is allowing herself to feel bad or even very upset about the event or situation for a short while and then dropping it and moving on. Feeling the pain or going through negative sensations with awareness helps dissolve those emotions and allows the mind to bounce back. For some people, the above might sound easier said than done. What if you tried but found it extremely difficult to move on from thinking about that event or situation that is causing you pain or creativity negativity in you? It is possible that the situation you are faced with has a far reaching long term impact on your life; for example- grieving the loss of a loved one,dealing with trauma from an event or accident and so on. In such cases, giving time for healing is important. 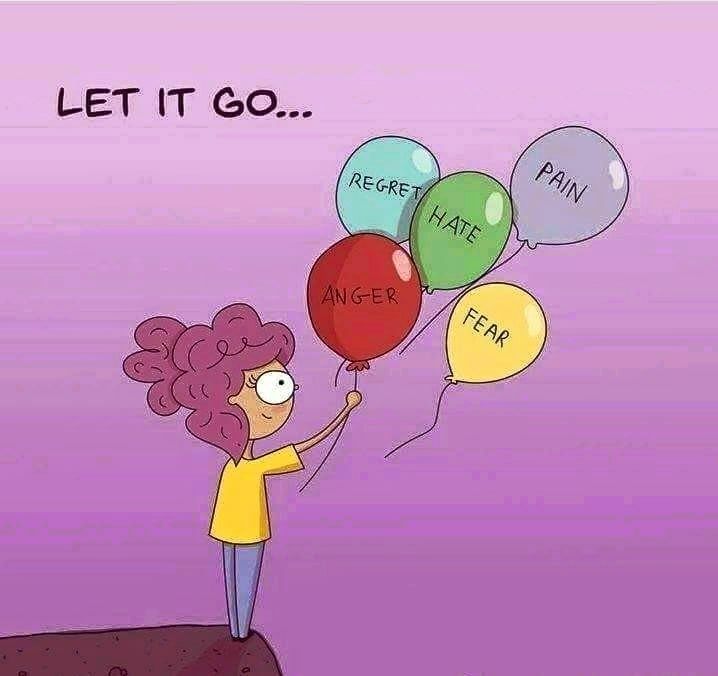 Even here, however, taking stock of the negative emotions you are experiencing and using simple proven science backed practices can help train the mind to acknowledge, accept and slowly but surely let go of the related negative emotions and anxiety and begin feeling joyful again. Below are a few of the practices I have used & benefitted from in times I have felt negative and anxious. You might find these useful to get started on your journey of ‘de-cluttering’ the mind of negativity and reclaiming the happiness you deserve! We’re not alone in our journey’s, no matter how tough they might seem and that’s probably the most important thing to know. Trying to figure out things in our own minds can get extremely complicated and stressful. Its ok to not know it all and ask for help. There are several individuals out there who have experienced similar situations to yours and felt varying degrees of negative emotions & feelings, be it trauma, anxiety, depression, loneliness, anger, guilt, regret,self-doubt, misery or stress. And the good news is, today, we have access to several communities and non-profits whose only mission is to help you alleviate those emotions and live happily again. Why not benefit from these amazing causes?10 years ago, when I felt stressed in my job and was dealing with other personal emotional issues, I believed I could sort it out myself, but in reality I needed help and how! My mom pushed me to take a stress management program with the Art of living Foundation and the resulting inner transformation I experienced not only pulled me out of the emotional disarray I was in, but also equipped me with tools to remain resilient on a daily basis. The only regret I ever had was wishing I hadn’t taken so long to listen to my mother’s advice, but as the saying goes, better late than never! So take that step and reach out for the help you need! Make that phone call, whether it is to that coach, friend, helpline, non-profit or community. You’ll be surprised at how many avenues are available to help deal with your situation and provide you with strength and support when you need it the most. 2. Asking yourself – will this matter five years from now ? Each time I weigh the situation that is bothering me against this question the answer is negative. My spiritual teacher Gurudev Sri Sri Ravishankar says looking at events in the context of time and space provides us with a bigger perspective and helps us to let go and move on. He also says-look at the past as a happening, the present as doing and the future as a combination of the two. That way you won’t regret what has already happened or brood over what is happening in the now or worry about the future as much. Sometimes just using writing as a medium for expressing your emotions and the anguish you feel due to an event or individual helps. Journaling or writing a diary has been proven by psychology as an extremely beneficial practice to let go of negative emotions. I used to vent my heart out and then tear the paper into pieces. It has a strange decluttering effect on the mind. It’s almost like saying goodbye to negative thoughts and emotions. The next time you feel anger, frustration or sadness coming up, try writing your thoughts and feelings on paper. You will find, the intensity of your emotions reduces and you might not even feel the negativity anymore. When we write down a negative experience and related emotions, we become a witness to the event and observe our feelings from a third person perspective which helps to release them. Taking time to quiet the mind provides it with relief from the barrage of negative thoughts constantly bombarding the mind. This for me has been the best and the most effective way of letting go. Negative thinking and constant complaining has an adverse impact on our brain cells, even causing the area at the back of our brain-the hippocampus to shrink, cites research by Stanford University. Of course the mind is not the easiest to quiet. I was used to overthinking what someone said till I drove myself to high levels of anxiety and low self -worth. Meditation and breathing helped declutter my mind and provided my nervous system with that much needed break! These practices are now an integral part of my daily routine. They provide my mind with the ability to let go and therefore feel more in control of my emotions! Science has now validated what ancient seers have been saying for centuries about meditation. Researchers from Michigan State University (MSU) have found neural evidence that mindfulness meditation helps to control negative feelings, not just in people who are naturally disposed to be mindful or well-practiced in meditation, but in anyone. So if you’re anxious about never having meditated before, don’t fret! Even a single session of 15-20 minutes can leave you feeling deeply rested, happier and less stressed. Check out my upcoming introduction to breathing & meditation workshops to know more. You are probably more fortunate than several others in this world. If you ever need a reminder, I highly recommend Sheryl Sandberg’s latest book, Option B. Sheryl talks about the coping mechanisms she and her family developed and used to return back to living their lives after losing her husband and her kids their father. She cites examples and draws strength from several amazing individuals & groups who demonstrated exemplary resilience and courage in the face of adversity. Just reading the book made me feel so grateful and fortunate for everything in my life that’s working and for all that I have! I also took a strengths finder survey by the VIA institute a few months ago and to my surprise gratitude emerged as my biggest strength! The ability to feel grateful or counting your blessings in negative moments has the effect of a balm on the mind. It shifts our thinking from misery to fulfilment and brings in a feeling of abundance, allowing us to let go of the negativity. So the next time you feel miserable about a situation, reflect on all those wonderful moments in your life and feel grateful for them. Keeping a gratitude journal and listing 3 things you are grateful for each day works as a great starting point. Often when we feel negative, we magnify the situation we are in and worry excessively about the consequences. Engaging in acts of kindness or service gives us an opportunity to make someone else feel better and that in turn uplifts our spirit. Some of the happiest and most fulfilling moments of my life are the ones I have spent volunteering or doing service projects. It has helped me shift my focus from worrying about myself all the time to how I can make a difference and bring a smile on someone’s face. Life teaches you the “Art of letting go” in every event says spiritual leader Gurudev Sri Sri Ravishankar. ‘Breathing out’ is as much as integral part of our biological functioning as is ‘breathing in’. Infact, we can’t hold our breath beyond a few minutes at the maximum. This simple realization makes it so much easier to let go of the negative emotions we tend to hold on to. What choice do we have anyway? Will holding on make things any better? So the next time you feel stressed or anxious, just breathe it all out and instead breathe in positivity! When you have learnt to let go, you will be joyful and as you start being joyful, more will be given to you, sums up Sri Sri. Not everything about negative emotions and situations in the past is bad. Using the past as a teacher goes beyond just dealing with negative situations, resulting emotions and the struggle to let go. It’s about drawing from past experiences to build mental toughness. When you are faced with a tough situation think about previous difficult times you’ve been faced with and the actions that helped you to overcome those challenges. Reflecting on this helps you draw from your strengths and build the required self -efficacy & capacity to deal with the situation, event or person. In summary, I believe that acknowledging and working through negative emotions is far more effective as opposed to resisting them or suppressing them. It might take some effort initially but the resulting inner relief and happiness is invaluable! I have benefitted immensely from the self-care practices that form part of my daily routine and I wouldn’t trade that time for anything! I am able to release pent up stress and negative emotions more effectively versus holding on to them. As a result I have the ability to stay positive, centered, focused and energetic through my day! I’d love to hear which of these practices you find most relevant to your life situation and which ones you might consider applying to improve the quality of your life. Wishing you a new year full of positivity! Divya is an accomplished sales and business development professional with over 9 years of experience with leading technology firms like IBM & Oracle. Currently she leads customer experience with inHabit workplace wellness and is the co-founder of a well-being consulting company called Human Prism. Mid-way through her sales career, Divya got introduced to self-care tools like breathing and meditation that significantly impacted her personal and professional well-being. She experienced reduced stress levels, increased happiness, higher emotional resilience and improved work performance leading her to create a life of fulfilment and purpose. Her personal well-being transformation journey inspired her to focus on impacting positive change in individuals and corporates through embracing the benefits of well-being. Divya is a trained meditation instructor with the Art of living Foundation and Certified Wellness Coach through an ICHWC (International Consortium of Health & Wellness Coaching) approved program. She has touched hundreds of lives through stress management workshops in India and Canada. She believes that change begins with you and when you take responsibility for your well-being, nothing can come in the way of your happiness and success.